Kelowna-raised artists Connor Charlesworth and Malcolm McCormick are both painters who have taken up the stance and exploration of taking painting apart, as if to see what makes it work. Their two-artist show at the Kelowna Art Gallery, Double Vision, nudges visitors to consider their own notions about what makes a painting and how a painting should be displayed. 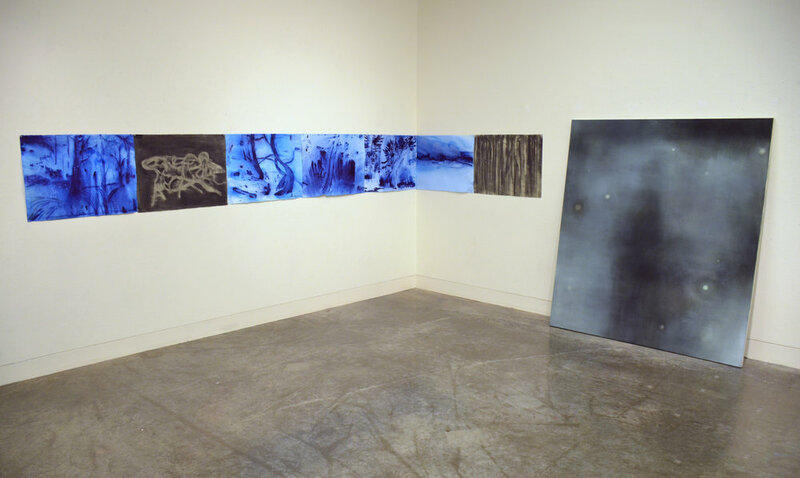 Instead of just hanging his paintings on the wall, Malcolm McCormick leans sheets of drywall onto the gallery walls and embeds his paintings in these by cutting holes into which he pops his canvases. This installation is further complicated by the addition of a digital print that includes a pale black-and-white reproduction of Pieter Bruegel the Elder’s 1568 The Wine of Saint Martin’s Day. Is this making a general reference to art of the past sitting behind any current work in painting? Or is it about this Bruegel painting in particular, which is noteworthy due to the main action of the narrative being off centre (to the right), while the middle part of the composition is full of drinking peasants? Viewers of Bruegel’s painting were apparently thrown by this device, and confused about which part they were meant to be focusing on. Is this a parallel McCormick sees for his own installations about painting, as he pitches us the curve ball of the canvases embedded in drywall? Charlesworth, currently based in Victoria, has been working with soaking paper in sea water and then working in semi-abstract, wet-in-wet modes that make reference to the sea shore and its landscape. Seven of these pieces are included in the current exhibition. His single large canvas in this show he chooses to rest on the floor, rather than hanging on the wall. In this large oil painting he has laid on an earth-toned ground and embedded within that a ghostly figure and a few scattered pale yellow dots. Viewers cannot discern whether they are looking down onto the surface of a calm body of water, seeing a dark and blurred reflection, or whether we are, in fact, on dry land and confronting a phantom. The space is indeterminate and floating: We are in a netherworld. As viewers, we may leave enriched by the experience of their work, or perhaps we are unsure, as some of our previously held paradigms have become destabilized? At an earlier time we could go into a room of paintings in a gallery or museum and take for granted that the art would be hanging on the walls. Now we realize that that situation is not neutral, in fact, but stemmed from multiple decisions by the artists and the museum staff. So when is a painting not a painting? Evidently when it is a deconstructed painting that is meant to make us think about the factors within and the cultural situation of painting. For both McCormick and Charlesworth the gallery space becomes a charged zone, and we confront their pieces with more inquiry due to the specifics of their installation. 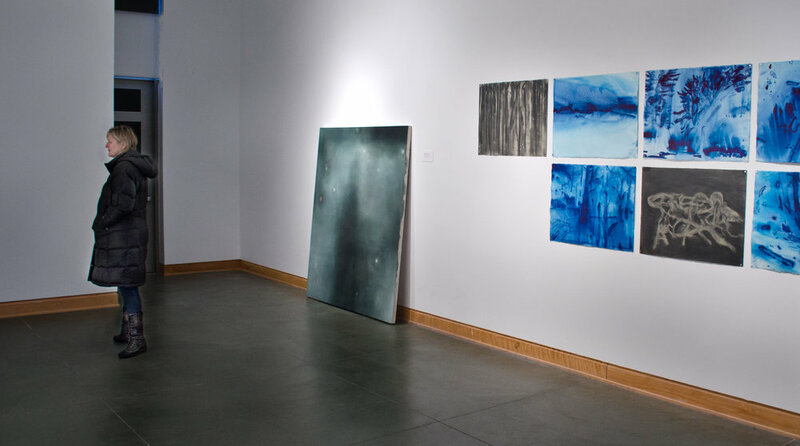 Both artists received their BFA degrees recently from the University of British Columbia Okanagan in Kelowna (Charlesworth in 2015 and McCormick in 2014). Malcolm McCormick is currently enrolled in the MFA program at Concordia University in Montreal, and Connor Charlesworth in the MFA program at the University of Victoria. (Left) Wakeful Dream Sequence, Ink & charcoal on paper, 22 x 210 in. (Right) Bodies, Oil on canvas, 76 x 64 in. Installation image: Double Vision: Malcolm McCormick & Connor Charlesworth, Kelowna Art Gallery, 2017.